One of the many things wrong with the current Israel-Palestine peace process is the absence of any attempt at reconciliation between the two peoples. Real peace cannot be achieved without reconciliation, and reconciliation needs to be based on truth. Relationships between the two peoples have been poisoned by different narratives of their shared history, some of them mythical. One of the most widespread and persistent myths is that Israel has never declared its borders. Indeed, Israel is frequently described as a borderless state. The purpose of this essay is to debunk this myth, and bring out the implications for understanding the history of the conflict and for the peace process. 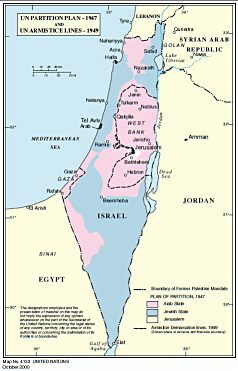 From 1922 to 1948 Palestine was administered by Great Britain under the Mandatory system established by Article 22 of the Covenant of the League of Nations after the First World War. The Turkish Empire was broken up into a number of separate territories under the tutelage of “advanced powers” who would regard the well-being and development of their peoples as “a sacred trust of civilization” until they could “stand alone” as independent states. to carry out its policy of the “establishment in Palestine of a national home for the Jewish people, it being clearly understood that nothing should be done which might prejudice the civil and religious rights of existing non-Jewish communities in Palestine”. Nature of the Jewish National Home. Consideration of the Articles of the Mandate shows that Palestine, while becoming the Jewish national home, would at the same time remain the national home of the existing Palestinian population, mostly Arabs. Three of the Articles specifically mention Jews. Article 4 set up a Jewish Agency to help Jews settle the land. Article 6 says that Britain should facilitate Jewish immigration under suitable conditions, while ensuring that the rights and position of other sections of the population were not prejudiced. Article 7 said the Jews should be helped to acquire Palestinian citizenship. In all other respects Jews and Arabs were to be treated on an equal basis. National languages were to be Hebrew and Arabic, and there were to be Hebrew and Arabic school systems. There is no hint anywhere that the incoming Jews should have a position superior to the non-Jewish community, and no mention of a Jewish state or an Arab state. This concept was further explained by the Churchill White Paper of 1922, which also quoted a resolution of the 1921 World Zionist Congress expressing “the determination of the Jewish people to live with the Arab people on terms of unity and mutual respect, and together with them to make the common home into a flourishing community, the up-building of which may assure to each of its peoples an undisturbed national development”. In other words, Palestine was to be a unitary bi-national state. Failure of the Mandate. To cut a long story short: this plan did not work. The Arabs objected to the inward migration of large numbers of foreign Jews into Palestine, and there was a popular revolt against the British administration from 1937-39, in which Jewish settlers were also attacked. The protests were violently suppressed by British forces working together with Jewish members of the Palestine Police and Jewish militias. In 1939, in the McDonald White Paper, the British authorities introduced severe restrictions on Jewish immigration, and they proposed independence for an Arab-majority Palestine within ten years. Towards the end of World War II, Jewish militias began a campaign against the British administration to resist this policy and circumvent the immigration restrictions. In 1947, the British Government gave up and asked the United Nations to take over the “Question of Palestine”. In response to the British Government’s letter asking the UN to consider the “Question of Palestine”, the General Assembly set up the Special Committee on Palestine (UNSCOP). Having referred UNSCOP’s report to an Ad hoc Committee of all Member states, the General Assembly passed Resolution 181 on November 29, 1947. The Resolution recommended the partition of Palestine into a Jewish state and an Arab state. There was a special role for Jerusalem as an international city, not part of either state. There was to be an economic union between the three entities. The territorial division specified in this Plan of Partition with Economic Union (or Partition Plan) is shown on the accompanying map (Arab state in pink, Jewish state in blue, Jerusalem in white). Each state was divided into three pieces, which were made contiguous by means of two neutral crossing points. (See them to the south-west of Nazareth and to the south-west of Ramle.) The port of Jaffa was to be an Arab enclave within the Jewish state. The Plan included a program for its implementation. This involved a Palestine Commission of five UN Member States which would gradually take over power from Britain in the run-up to the end of the Mandate. The commission would appoint provisional governments for each state, which would set up constituent assemblies and hold elections, the aim being for the two states to become independent no later than two months after the end of the Mandate. Arab rejection. The Plan was rejected by the Arab Palestinians and the Arab states because they objected in principal to the division of their land. They had always rejected the Zionist plan for the migration of Jews to Palestine, saying that the attempt to establish a Jewish national home in Palestine would violate the right of the existing population to self-determination. This view was correct, as confirmed in the UNSCOP report (see Chapter II, paragraph 176), and in the detailed study by Jeremy R. Hammond in his book The Rejection of Palestinian Self-Determination (Kindle edition). The Arab Higher Committee, representing the Arab Palestinians, told the Ad hoc Committee that it was their sacred duty to defend their country against the aggressive campaign being waged by the Zionists with the object of securing by force a country, Palestine, which was not theirs by right. The only solution they would support would be independence for Palestine on termination of the Mandate, as a unitary Arab state with guarantees for minorities. Zionist acceptance. The plan was accepted by the Zionist leadership because it offered them what they had always wanted: a Jewish state. Even a Jewish state limited to part of Palestine was preferable to the failed attempt to establish a Jewish national home as part of a bi-national state of Palestine. Nevertheless, reluctantly but loyally, we accepted the decision which appeared fair and reasonable to the United Nations… We regard it as binding, and we are resolved to move forward in the spirit of that decision. The Partition Plan resolution was not a binding decision. The Arabs were not being disloyal to the UN by rejecting it, as this statement may be designed to suggest. It was a recommendation only, and they were perfectly entitled to reject it as contrary to their interests and their rights. We will see in the next section what the Zionists meant by “moving forward in the spirit of that decision”. The publication of the Partition Plan led to a fierce civil war in Palestine between Jews and Arabs. The British said they would not participate in the implementation of a plan that was not supported by the majority of the population, and set the date for termination of the Mandate to May 14, 1948, at midnight. Against a background of violence, a Special Session of the UN General Assembly was called, starting on April 16, 1948. “it was an illegal scheme, contrary to the rights and interests of the Arabs; the only course the United Kingdom could have taken at the end of the Mandate, morally speaking, was to turn over Palestine as a unit to one Palestinian Government representing all the lawful citizens of the Holy Land”. The Arabs also considered the alternative of a unilateral declaration at the end of the Mandate: failing an agreed interim arrangement, “the overwhelming majority of the people of Palestine would establish an independent Palestinian Government”. However, they took no practical steps to put this into practice. On April 17, the UN Security Council in Resolution 46 called upon everyone in Palestine to cease all military activity, and also to “refrain… from any political activity which might prejudice the rights, claims, or position of either community”. A unilateral declaration of independence would be such an activity. The idea of a unilateral declaration was also opposed by the US State Department under George Marshall. President Truman was more sympathetic to the idea. At a meeting on May 12, White House Counsel Clark Clifford argued in favor of recognizing the new Jewish state. Marshall opposed Clifford’s arguments, and said that if Truman followed Clifford’s advice and recognized the Jewish state, then he (Marshall) would vote against Truman in the forthcoming election. The Zionist leadership created a National Council, an embryonic parliament for the new state; and a 13-member National Administration which was to become the provisional government of the new state, led by David Ben-Gurion as Prime Minister and also Defence Minister. The National Administration met on May 12, 1948. The story of that meeting is told in an article by Shelley Kleiman on the Israel Government website. They took the final decision to go ahead with the declaration of statehood. Contacted by telephone in New York, Chaim Weizmann, the Chairman of the World Zionist Organization, endorsed the decision, and he wrote a personal letter to President Truman appealing to him to recognize the new state. Conclusion 1. Israel’s Declaration was not authorized by the United Nations, and was made in violation of Security Council Resolution 46. It was not an implementation of the Partition Plan. For a meaningful existence states need recognition by other states. To be recognized as a state Israel needed a defined territory under Article 1 of the Montevideo Convention. And what borders could they possibly specify? Those of the Partition Plan. The borders are the essence of the Plan. They had publicly accepted it. That was the territory they already controlled. Israel’s Declaration implicitly declares the borders of the State to be those of the Partition Plan. And, as we shall see, on the same day they also made that declaration explicit. The letter sent on May 12, 1948 by Chaim Weizmann to US President Truman was successful. On May 14 Truman recognized the State of Israel. The story of events that day in Washington is told in the telegram that Epstein, the representative of the Jewish Agency in the USA, sent to Shertok (later Sharett), the Foreign Minister of the Provisional Government in Tel Aviv. 5. Earlier during the day Loy Henderson phoned to ascertain boundaries of new State. Advised that boundaries in accordance with U.N Resolution. 6. Circumstances required that I take title for this act and assume responsibility for sending letter. Clark Clifford in his memoirs has a slightly different version of events. He says that he helped Epstein to compose the request for recognition, and that it was he who told Epstein “it was particularly important to claim nothing beyond the boundaries outlined in the UN Resolution”. The recognition was timed at 6:11 p.m EST, ten minutes after Israel’s Declaration became effective. Original documents. The reader might enjoy looking at copies of the original documents: (i) the personal letter from Weizmann to President Truman asking him to recognize the new state; (ii) the formal request for recognition sent by Epstein to Truman and the State Department; (iii) the draft of Truman’s reply, with the name of the state, Israel, added by hand; and (iv) the telegram from Epstein to Shertok. Documents (i) and (ii) are in the Truman library; (iii) was presented by President Peres of Israel to President Obama when he went to Washington in 1912 to receive the Presidential Medal of Freedom; (iv) is in the Israel State Archives. Israel a Sovereign State. There is no doubt that on May 14, 1948 the State of Israel was declared on the basis of Partition Plan and with the borders specified in that Plan, and that it was recognized as a state with those borders by the USA. Further recognitions followed, the first being by the Soviet Union on May 17. The question is sometimes asked whether the creation of Israel was ‘legal’. We have already seen that its unilateral Declaration was not authorized by the United Nations, and that the partition of the land against the will of the majority population violated their right to self-determination. However, under the modern geopolitical system the land surface of the world is divided into independent sovereign states. ‘Sovereign’ means they rule the territory within their borders absolutely: there is no World Government that could decide whether a new state was created legally or illegally, or could tell it what to do within its own territory. The Zionist leadership created the sovereign State of Israel, and the borders they specified at that time are its sovereign borders: the borders within which Israel claimed and exercised sovereign authority. The Provisional Government of Israel exercises control over the entire area of the Jewish State as defined in the Resolution of the General Assembly of the 29th November, 1947. In addition, the Provisional Government exercises control over the city of Jaffa; north-western Galilee, including Acre, Zib, Base, and the Jewish settlements up to the Lebanese frontier; a strip of territory alongside the road from Hilda to Jerusalem; almost all of new Jerusalem; and of the Jewish quarter within the walls of the Old City of Jerusalem. The above areas, outside the territory of the State of Israel, are under the control of the military authorities of the State of Israel, who are strictly adhering to international regulations in this regard. There was no doubt at the time as to the location of Israel’s borders, since the text of Epstein’s letter to Truman, and Truman’s reply, were released to the press on May 15, 1948. Declared borders can be changed. Any two states can agree changes to their mutual border, but changing borders by conquest through war is not legal, because it violates the fundamental principles of the United Nations Charter. As we shall see, Israel has never made an agreement with any neighbor to change its borders (other than minor revisions in the peace treaties with Egypt and Jordan); neither has it ever formally claimed sovereignty over (annexed) any territory outside its declared sovereign borders, let alone been recognized on any other borders. Conclusion 2. On May 14, 1948, the Zionist leadership created the State of Israel, asking for and receiving recognition by other states within the sovereign borders specified in the UN Partition Plan of November, 1947. All territory acquired by Israel outside those borders has been acquired by war, in violation of the UN Charter. The Partition Plan borders are the sovereign borders of Israel to this day. It is important that Israelis, and everyone who is interested in the Israel-Palestine issue, knows about the declaration of Israel’s sovereign borders on May 14, 1948, because that knowledge puts many other issues into their correct context. 6. Palestine Although Israel’s Declaration was not an implementation of the UN Partition Plan according to the process described in the Plan, it did in fact partition the land into two territories: the State of Israel, and the remainder of Palestine outside the sovereign borders of Israel, corresponding to the area of the Arab state in the Partition Plan. Palestine was in a sorry state, with much of its population having become refugees. It had no government because the Mandate had ended, and there was no effective Arab political leadership. It was a non-self-governing territory. The Palestinians were represented initially by the Arab League through the Arab Higher Committee, based in Cairo, and later by the Palestine Liberation Organization (PLO) which was founded in 1964. The Jewish national home policy of the British Mandate had made it impossible for the Palestinians to exercise their right of self-determination in Mandatory Palestine. But, because Israel’s border declaration limited the sovereign extent of the State of Israel to that specified for the Jewish state in the Partition Plan, it also defined the borders of the non-self-governing territory of Palestine, creating the possibility that the Palestinians could exercise that right, the right to their own State, in the territory allocated to the Arab state in the Partition Plan. Conclusion 3. The principle of self-determination gives the Palestinian people the right to establish their own State in that part of Palestine allocated to the Arab state in the Partition Plan. Jerusalem. Zion is a synonym for Jerusalem, the ancient city at the center of Jewish religious life. Zionism is the political expression of the Jewish longing to return to the ancient home, expressed in the liturgical use of the phrase “next year in Jerusalem”. How is it, then, that in the Declaration of the State of Israel, no mention at all is made of Jerusalem? The answer is that the whole of Jerusalem lies entirely outside the declared borders of Israel. Jerusalem was not declared capital until Israeli forces had gained control of the city, in December 1948. This is not accepted by the international community, and no nations have their embassies in Jerusalem. Israel was founded in the midst of civil war. There was fighting between Jews and Arabs throughout Palestine. When Israel’s Declaration became effective just after midnight on May 15, 1948, the Jewish militias, fighting outside the area allocated to the Jewish state in the Partition Plan, became the armed forces of Israel, fighting outside its declared sovereign borders in the territory of Palestine. On the night of May 14 to 15, forces of Syria, Lebanon, Iraq, Jordan and Egypt entered Palestine. Because Israeli forces were already in Palestine, the civil war in former Palestine became a war between the State of Israel and the five Arab states. The Arab League announced this intervention openly in a cablegram to the UN. The reasons given were to restore law and order in the absence of any governmental authority, and to resist Jewish aggression against the Arab population. They also claimed authority under Chapter VIII of the UN Charter, as a recognized regional organization, to intervene to prevent the conflict spreading. Both of these are reasonable: a forward defense to prevent attacks on the State of Israel, and an intervention in the neighboring territory, where there was no lawful authority, to protect Jewish life and property. The justifications used by the two sides for the presence of their armed forces in Palestine are the mirror images of each other. Zionists often describe the intervention of the Arab League forces in Palestine as an invasion of Israel, with the intention of “strangling the infant state at birth’”, as Ben-Gurion put it in his report to the Provisional Government on June 3. However, most of the fighting took place in Palestine, outside the borders of Israel. There was some penetration of Arab forces into Israeli territory, justified by the need to protect Arab residents, just as the presence of Israeli forces in Palestine was justified by the need to protect Jewish residents. If the Arab League had a military plan to occupy the area of the Jewish state, overthrow the Israeli government, and re-unite Palestine by force, it was a complete failure. Israel’s military plan certainly included territorial expansion. We have already seen how, on May 12, Ben-Gurion was talking about incorporating captured territory into the State. Recognition achieved on May 15, this doctrine re-emerged a few days later. On May 20, the Provisional Government decided that “the United Nations was to be informed that Israel would not respect the partition lines of 1947 unless there was an Arab partner”. By May 22 Israeli forces already had control of Jaffa, north-western Galilee, and much of Jerusalem. Jaffa and north-western Galilee had been assigned to the Arab state in the Partition Plan. We have already seen that in propounding his doctrine Ben-Gurion had given western Galilee as an example of territory that they might capture. They had previously objected to the inclusion of this area within the Arab state in the Partition Plan. Ben-Gurion’s report to the Provisional Government makes clear Israel’s aggressive intent towards Palestinian territory: “we have conquered several important districts outside those [Partition Plan] boundaries”; “our forces are striking at the Arab Triangle and they stand at the gates of Jenin. Tulkarm is under attack and Nablus quivers with fear”; “to the greatest possible extent, we will remain constantly on the offensive, which will not be confined to the borders of the Jewish State”. During the war the area under Israeli control expanded until the armistice agreements of 1949 left all of Mandatory Palestine in Israeli hands, except for the areas known now as the West Bank and East Jerusalem, which were under military occupation by Jordan, and the Gaza Strip, which was under military occupation by Egypt. In the Partition Plan map above, it can be seen that the area of Palestinian land (pink) between the Armistice Line and the territory of Israel (blue) is considerable. It includes the towns of Acre, Ashkelon, Jaffa, Nazareth, Ramle, Beersheba, Lydda, and West Jerusalem. In the Partition Plan the Jewish state was allocated 55 percent of Mandatory Palestine, and the Arab state 45 percent. The territory captured by Israel in the war was 23 percent, leaving the Palestinians with only 22 percent. Conclusion 4. The 1948-49 Arab-Israeli war was a war of expansion in which Israel increased the proportion of Mandatory Palestine under its control from 55 percent to 78 percent, including West Jerusalem. Who was the aggressor? The UN Security Council met on May 15, 1948 and had before it the Declaration of Establishment of the State of Israel, the Arab League cablegram announcing the intervention in Palestine, and communications from both sides complaining about aggressions and atrocities by the other. The representative of the Jewish Agency, for Israel, demanded an enforceable Chapter VII resolution condemning Arab aggression. The representative of the Arab Higher Committee, for the Palestinians, supported by Syria and Egypt, questioned the right of the Jewish Agency to term as aggression the entry of Arab forces which had been invited by the Arab Higher Committee to maintain law and order. With the termination of the Mandate, he asserted, Palestine had become an independent nation and the Jews constituted a rebellious minority. The Security Council did not assign blame to either side. After several days of discussion it passed Resolution 49, calling for a cease-fire. …ongoing discussion… on the legal status of territories beyond the 1947 partition lines. If everyone stops and goes back to the partition plan, so will Israel; until then, here’s how we’ll apply our law to the newly acquired areas. Any law applying to the whole of the State of Israel shall be deemed to apply to the whole of the area including both the area of the State of Israel and any part of Palestine which the Minister of Defence has defined by proclamation as being held by the Defence Army of Israel. This Ordinance shall have effect retroactively as from May 15, 1948. If they had held the territory under military occupation, the civilian population would have been protected under the laws of war. But with the territory administered under Israeli law, they could do whatever they wanted. In their meeting on May 20 they decided that: “a legal device for the acquisition of Arab property was to be promulgated”; on July 21 that “Arabs who left would not be allowed back, as a general rule”; and that “a ministerial committee would have the authority to destroy empty villages”. The seizure and destruction of civilian property is not allowed under the laws of war. Administering the captured territory under Israeli law meant that it was treated as if it were part of Israel. We may call this the Israeli Law Device. In this way, it became in effect (de facto) annexed to Israel, and the Armistice Line became the de facto border of Israel. Because Israel has no intention of returning this territory, it is properly called stolen land. Sharett has not brought out the Ben-Gurion Doctrine this time. He has a new idea, we may call it the Sharett Doctrine. Leaving aside the rhetoric, his claim is that Israel needs to hold territory outside its original borders in order to maintain defense positions and security zones. If Israel were holding this territory in military occupation, pending a peace treaty, fair enough. But instead it has included that territory permanently within its de facto borders. What will happen if it needs to defend those borders? Will it need to acquire more ‘security zones’ outside those borders? This is a recipe for perpetual conquest. Conclusion 5. The Palestinian territory captured by Israel in the 1948-49 war was illegally incorporated into the State by the device of applying Israeli law in captured territory, resulting in the 1949 Armistice Line becoming the de facto border of Israel. The captured territory is not legally part of Israel: it has been stolen. The 1967 borders. The term “pre-1967 border” or “1967 border” is commonly used to describe the 1949 Armistice Line which became the de facto border of Israel in the absence of any peace agreement. This is a misleading description, for two reasons. First, the Armistice Line is not recognized as a territorial border. Second, there was no significant change in the line of the de facto border in 1967. It is equally misleading to call the territory inside the de facto border “Israel proper” since almost a third of that territory is outside Israel’s declared sovereign borders. Conclusion 6. By administering the captured Palestinian territory as if it were part of the State, Israel has violated the “sacred trust” for the people of that territory assigned to it by Chapter XI of the UN Charter. The Lausanne Conference. In December 1948 the UN General Assembly Resolution 194 established the Palestine Conciliation Commission (UNPCC), with instructions to assist the parties to achieve a final settlement of all questions outstanding between them. The Resolution required that the Jerusalem area (including Bethlehem) should have a special international status, as in the Partition Plan; and that refugees wishing to return to their homes and live at peace with their neighbors should be permitted to do so at the earliest practicable date. The other main outstanding issue was the question of territorial boundaries. The Commission started work on January 24, 1949, and it was during its first phase of work that the Armistice Agreements with Egypt, Lebanon and Jordan were signed in February, March and April respectively. The Agreement with Syria came later, in July. The Commission called a conference of the parties in Lausanne, which opened on April 27. It did not go well. The Arab states refused to speak directly with the Israelis, all discussions being conducted through the Commission. The Arab states wanted to negotiate as a block, whereas Israel wanted to deal with them individually. The Arabs were not willing to talk about other issues until the question of the refugees had been dealt with: Israel would only discuss the refugee issue as part of an overall peace plan. On the question of Jerusalem, Israel’s position was that only the Holy Places in the City (which were under Jordanian control) should be internationalized; on the refugees, Israel would not recognize their right of return, and thought that they should mostly be resettled in the Arab states; and on the territorial question, Israel was determined to keep the territory captured in the 1948-49 war. It was difficult to distinguish between what the authorities considered part of Israel and what they considered merely temporarily-occupied territory, if such a qualification existed at all in their thinking. To admit Israel before it had given up territories which had not been allotted to it by the Assembly’s decision [the Partition Plan] was equivalent to giving it a blank cheque to draw its frontiers wherever it wished. In effect, it meant condoning, by a solemn act of the United Nations, the right of conquest. Nevertheless, Israel was declared to be a peace-loving State and admitted to Membership. The Lausanne Protocol. In Lausanne on the following day, May 12, 1949, all parties signed the Lausanne Protocol, accepting that the Partition Plan boundaries would be the basis of discussion. Thereafter, the conference made some progress, with both sides making proposals on the linked issues of territory and refugees, but no agreement was reached. On the territorial issue, the final statement from the Arabs was a claim to all the territory allocated to them under the Partition Plan, plus Eastern Galilee and the Negev, “in order to facilitate the resettlement in Palestine of a larger number of refugees”. This was the first time that the Arabs conceded the existence of Israel as an entity that had to be negotiated with, albeit not directly. The Government of Israel now asserts its title to the territory over which its authority is actually recognized (i.e., within the Armistice Lines). Of the territory now constituting the State of Israel, there can be no cession. This is not a formal claim of sovereignty over the stolen land (annexation) but close to it; it would have been even closer if they had not used the inappropriate word “title”, which refers to ownership of real estate, not sovereignty over territory. The Government of the US is seriously disturbed by the attitude of Israel with respect to a territorial settlement in Palestine and to the question of Palestinian refugees. The Govt. has recently made representations to Israel about the refugees in conformity with Resolution 194, and urged the acceptance of the principle of substantial repatriation… In the interests of a just and equitable settlement of territorial questions the US has supported the position that Israel should be expected to offer territorial compensation for any territorial acquisition it expects to effect beyond the boundaries of Resolution 181… If the Govt. of Israel continues to reject the basic principles set forth in Resolution 194 and the friendly advice offered by the US Govt, the US Govt. will regretfully be forced to the conclusion that a revision of its attitude to Israel will become unavoidable. Conclusion 7. At the Lausanne conference Israel accepted that the Partition Plan boundaries should be the basis of territorial discussions: but then refused any retreat from the Armistice Lines, and any territorial compensation, leading President Truman to warn that this attitude would harm US-Israel relations. Annexation of West Bank by Jordan. On December 1, 1949, the Jericho Conference between King Abdullah of Jordan and some Palestinian leaders proposed that Jordan should annex the area of Palestine it was occupying under the Armistice Agreement; the annexation took place on April 24, 1950. The annexed territory was renamed “the West Bank”. …it is not the custom of this country to issue formal statements of recognition every time a foreign country changes its territorial area. The union of Arab Palestine with Jordan had been brought about as a result of the will of the people, and the US accepted the fact that Jordanian sovereignty had been extended to the new area”. The UN also accepted the Jordanian annexation. For example, in 1966, in the “Samu incident”, a substantial Israeli force raided the southern Hebron area. In Resolution 228 condemning the raid, the UN Security Council described the location as “territory of Jordan”. Conclusion 8. From 1950 onwards, the West Bank was considered part of Jordan by the international community. It was held in trust for the Palestinians, and this status was accepted by the PLO. The 1956 Suez war and the fantastic plan. In July 1956 Nasser, President of Egypt, nationalized the Suez Canal. At a secret meeting in Sevres, France, leaders from Britain, France and Israel conspired to attack Egypt with the intention of removing Nasser from power and restoring international control to the Canal. The intention was for Israel to attack Egyptian forces in Sinai, providing Britain and France with a pretext to occupy the Suez Canal Zone, ostensibly in order to separate the combatants and protect the Canal. The Israelis also stated their intention to capture and annex territory on the eastern coast of Sinai, in order to protect the Straits of Tiran which allow access to the Israeli port of Eilat from the Red Sea, and at the time were blocked by Egypt. Jordan, he observed, was not viable as an independent state and should therefore be divided. Iraq would get the East Bank in return for a promise to settle the Palestinian refugees there and to make peace with Israel while the West Bank would be attached to Israel as a semi-autonomous region. Lebanon suffered from having a large Muslim population which was concentrated in the south. The problem could be solved by Israel’s expansion up to the Litani River, thereby helping to turn Lebanon into a more compact Christian state. The expansion to the Litani River was not a new idea: the river had been proposed as the northern border of Israel by the Zionists at the 1919 Paris Peace Conference. They also included the Golan Heights within their suggested borders (see map). Conclusion 9. In 1956, Ben-Gurion was planning further expansion of Israel’s borders. The attack on Egypt took place as planned, on October 26, and was militarily successful. It was opposed by both the US and USSR, and eventually forces were withdrawn with Nasser still in power. However, Israel achieved its goal of re-opening the Straits of Tiran. The Palestine Liberation Organization (PLO) was founded in 1964. Its Charter defines Palestine as an indivisible territorial unit, within its boundaries at the time of the British Mandate; its goal is to liberate Palestine from the conspiracy of international Zionism and colonialism that has dispossessed it of its homeland and property; its method is jihad. This Organization does not exercise any territorial sovereignty over the West Bank in the Hashemite Kingdom of Jordan, on the Gaza Strip or in the Himmah Area. Its activities will be on the national popular level in the liberational, organizational, political and financial fields. The three areas mentioned are those under the control of Jordan, Egypt and Syria. (The Himmah Area consists of a few square kilometers to the south-east of Lake Tiberias, part of the sovereign territory of Israel, occupied by Syria from 1949 to 1967). The Article reassured the three states that, although the PLO was going to organize in the regions which the states controlled, it was not going to challenge their authority. Use of the phrase “does not exercise sovereignty” reminded them that the PLO did claim sovereignty, and expected the territories to be returned to them when Palestine was liberated from the Zionists. Note: Jihad, “struggle in the way of Allah“, can mean an inner spiritual struggle, or an outer physical struggle, and the latter can be non-violent or violent. For example, there is “jihad of the pen”, a written debate. A valid form of jihad is armed struggle against oppression and persecution, or in defense of a Muslim homeland. The 1967 war between Israel and the Arab states of Egypt, Syria, and Jordan, starting on June 5th, was a comprehensive defeat for the Arabs. Israel gained control of the Sinai peninsula (part of the sovereign territory of Egypt); the Gaza strip (part of the territory of Palestine, under the military control of Egypt); the Golan heights (part of the sovereign territory of Syria); and the West Bank, including East Jerusalem (Jordanian territory, held in trust for the Palestinian people). It was now controlling all of Mandatory Palestine, plus territory in Egypt and Syria. The war ended with a cease-fire under UN auspices, but no armistice agreement. The Arab Heads of State have agreed to unite their political efforts at the international and diplomatic level to eliminate the effects of the aggression and to ensure the withdrawal of the aggressive Israeli forces from the Arab lands which have been occupied since the aggression of June 5. This will be done within the framework of the main principles by which the Arab States abide, namely, no peace with Israel, no recognition of Israel, no negotiations with Israel, and insistence on the rights of the Palestinian people in their own country. The second sentence of the Resolution contains the famous three “no”s. Not surprisingly, Israel considered that this statement would make a peace agreement impossible. The Arab position was similar to that in Lausanne in 1948, and was based on their belief that the creation of Israel was illegitimate under the UN Charter. However, the Lausanne experience (see previous section) shows that, when pushed, the Arabs could accept the reality of Israel’s existence and make territorial proposals via a third party. In the first sentence of the resolution the Arabs were clearly hoping that the Security Council would enforce a quick withdrawal. If that had happened, there would have been no need for any negotiations with Israel. Instead, the Security Council took a long term view. Although it has been the subject of much controversy, this resolution is easy to interpret if we bear in mind a simple principle: a Security Council Resolution is not a puzzle to be solved: it is a legal document which means what the words say. It is invalid to draw conclusions from the words it does not say. Principle (i) is very specific. Israel’s troops must go back to where they came from. That is back to Israel, inside Israel’s de facto borders, the 1949 Armistice Lines. Principle (ii) is general, and could be applied in any conflict situation. Put colloquially, it says that states in the area should stop fighting, get together to sort out where their borders are, and stick to them. It is not difficult to work out how Principle (ii) applies in this particular conflict. The Arab states had not respected the right of Israel to have recognized boundaries, indeed they had not even recognized the existence of Israel. Israel had not respected the right of the Arab states to have secure boundaries and had violated their territorial integrity. The resolution says nothing about timing. If the drafters had said, in Principle (i), “Early withdrawal” or some similar formulation, we might not have had 47 years of Israeli occupation of the West Bank and Gaza. But they didn’t. The resolution says nothing about the Palestinians and their territory of Palestine. If the drafters had included a third principal about the right of the Palestinian people to self-determination within Palestine we might not have had 47 more years of the denial of that right. But they didn’t. We wanted that to be left a little vague and subject to future negotiation because we thought the Israeli border along the West Bank could be “rationalized”. The use of deliberate vagueness to express intention produces only confusion: drafters should say what they mean. In this case, there is actually no need to say anything. The border to which the forces must withdraw is the de facto border of Israel, the 1949 Armistice Line. These were decided in 1949 by agreement between the parties, based on military considerations and other factors such as minimizing interference with the lives of local residents. These factors may have changed by 1967. The process of withdrawal will involve discussions between the parties: there is nothing to stop them “rationalizing” the lines by mutual agreement, providing it is stated that this is done without prejudice to a final border determination. Such a provision is always included in armistice agreements. 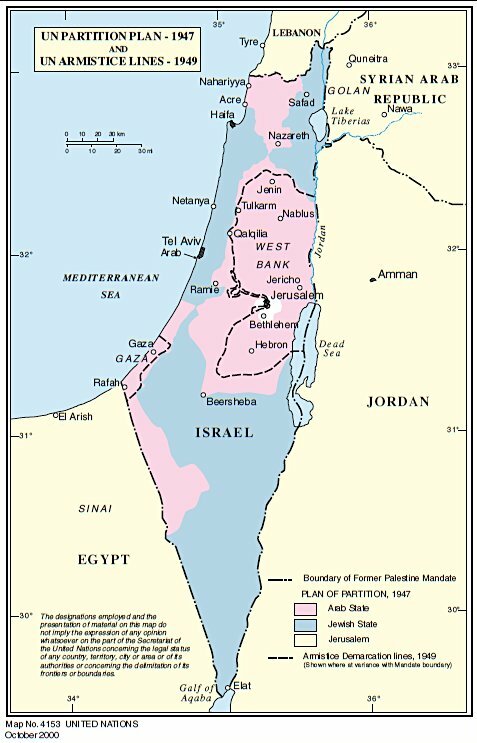 The 1947 UN Partition Plan called for the Palestinian people to have a much larger section of historic Palestine for their state than do the 1967 boundaries set forth in Resolutions 242/338. 1. The resolution does not set forth any boundaries: no such words appear. 2. The UN Security Council does not have the authority to specify the borders of a State; that is a matter for States to decide in agreement with their neighbors. 3. The writer seems to assume that because forces are to withdraw to the Armistice Lines, those lines automatically become the final borders. There is no basis for such an assumption. Principle (i) is not a method of implementing Principle(ii). Principle (i) requires an end to the occupation; final borders are to be negotiated under Principle (ii). 4. In 1967 there was no thought of a Palestinian state: the aim of the PLO and the Arab states was the liberation of all of Palestine from Zionist rule; the aim of Israel was further territorial expansion. It is an unwarranted assumption that any borders decided between Israel and the Arab states would automatically apply were a Palestinian state to be created at a later date. This misunderstanding of Resolution 242 is prejudicial to the interests of the Palestinians, because if the Security Council had specified the Armistice Lines as the borders between Israel and Palestine, it would have legitimized the land left of 1948-49. We will discuss the consequences towards the end of this essay. Conclusion 10. Resolution 242 does not say anything about the position of any borders. It says nothing about the Palestinians. It does not legitimize Israel’s land theft in 1948-49. The sacred trust extended. Resolution 242 addresses itself only to States in the area, saying nothing explicit about Palestine. This does not mean that the right of the Palestinians to self-determination has been removed. The occupied territory in the West Bank and Gaza is part of the non-self-governing territory of Palestine, and Israel must withdraw from it. Until it does so, the legal requirements remain. Israel must administer those territories as a “sacred trust” on behalf of the Palestinian people, under Chapter XI of the UN Charter. While holding the territories under military occupation, it must also obey the laws of war, in particular the Fourth Geneva Convention on the Protection of Civilian Persons in Time of War. The settlements. Very soon after the cease-fire, Israel began to establish settlements of Jewish Israelis in all four occupied areas: Sinai, Gaza, the Golan Heights, and the West Bank (including East Jerusalem). This proves that Israel intended to steal those territories, just as it had done with territory captured in the 1948-49 war. Conclusion 11.The 1967 war was another war of conquest and colonization by Israel, attempting to acquire territory by war, in violation of fundamental principles of the UN Charter. Israel obviously has no right to organize the settlement of its citizens in territory outside its own declared sovereign borders, under force of arms. The settlement program violates Article 49 of the Fourth Geneva Convention, as confirmed by the UN Security Council in Resolution 446, and the International Court of Justice. The settlement program is also a War Crime under Article 8 of the Rome Statute of the International Criminal Court. This means the Government Ministers authorizing it bear personal criminal responsibility for the program. This particularly applies to the Military Commander who rules the occupied areas by decree. His authority “flows from the provisions of public international law regarding belligerent occupation” He has a responsibility to disobey orders that are illegal in international law, but in practice, he decrees whatever the Israeli Government tells him to. There has been no peace agreement between Israel and Syria, and the settlement program in the Golan Heights has continued. In 1981 Israel used the Israeli Law Device, first introduced in 1948 (see section 8), declaring the Golan Heights subject to Israel law, thereby making the area de facto part of Israel, without formally claiming sovereignty. UN Security Council Resolution 497 declared this action “null and void”. Conclusion 12. The Israeli settlement program in occupied territories is illegal in international law. Israeli Government officials authorizing it are committing a war crime. The Yom Kippur War (or October War) of 1973 was a failed attempt by Egypt and Syria to regain the territories occupied by Israel since 1967. However, it did lead to the Egypt-Israel Peace Agreement of 1978, followed by a complete withdrawal of Israeli forces and settlers from Sinai by 1982. On November 22 the General Assembly passed Resolution 3236 reaffirming the inalienable rights of the Palestinian people to self-determination, national independence and sovereignty in Palestine; and also the inalienable right of those displaced to return to their homes and property. The PLO was recognized as the representative of the Palestinian people. The Fez declaration. In September 1982 the Fez Declaration of the Arab Summit called for Israel’s withdrawal from Arab territories occupied in 1967, including Arab Jerusalem; the dismantling of the settlements; re-affirmation of the right of the Palestinians to self-determination; the placing of the Gaza strip and West Bank under UN supervision for a short period; and the establishment of an independent Palestinian State with its capital in Jerusalem. The Declaration is not incompatible with the re-unification of Palestine into a single state, which was the goal of the PLO. However, the wording more strongly suggests the creation of a separate Palestinian State in the West Bank and Gaza: the beginning of the acceptance by the Arabs of the existence of Israel, and the possibility of a two-state solution. Geneva 1983. In 1983 the General Assembly organized the International Conference on the Question of Palestine in Geneva. Its report called for an international peace conference of all parties to the conflict, and other concerned States, “with the aim of achieving a comprehensive, just and lasting solution to the Arab-Israeli conflict, an essential element of which would be the establishment of an independent Palestinian State in Palestine”; it also invited the Security Council to facilitate the organization of the peace conference. The peace conference was never held, because the United States and Israel refused to take part. The State of Palestine. On July 31, 1988 King Hussein of Jordan severed all legal and administrative ties with the West Bank, ending its trust status and returning sovereignty to the Palestinians. This paved the way for the Palestinian National Council, meeting in Algiers in November, to make the Palestinian Declaration of Independence, proclaiming “the establishment of the State of Palestine on our Palestinian territory with its capital Jerusalem.” It did not specify the extent of its territory, although it claimed that the Partition Plan resolution gave it international legitimacy. The establishment of the State of Palestine was acknowledged by the UN General Assembly. The State of Palestine has been formally recognized by over 130 other states. The State was created by declaration and recognition: exactly the same process that created Israel. The difference is that Palestine cannot exercise sovereignty over its territory, because it is occupied by Israel (though it has some degree of autonomy in some of the West Bank). Accompanying the Declaration of Independence was a Political Communiqué which called for a peace conference based on the Fez Declaration and Resolution 242. These ideas were also expounded in Arafat’s second UN speech on December 13. More recently, Palestine made explicit what is suggested by the wording of the Fez Declaration: the territory proposed for the State consists of the West Bank and Gaza, amounting to 22% of historic Palestine, whereas the Partition Plan allocated 45% for the Arab State. The territory stolen by Israel in 1948-49 is legally part of Palestine, although de facto part of Israel. Palestine has recognized that this latter status is irreversible, and has agreed that Israel can keep the stolen territory. This is a huge concession. In the view of this author, and admittedly with the benefit of hindsight, this agreement was a major mistake by the Palestinians. It was never possible that such an unequal starting point could ever produce a just a lasting peace. Until the Government of Israel can bring itself to say “The State of Palestine has a right to exist in peace and security” talking to them is futile. Twenty years have been wasted. Oslo, Wye River, Camp David, the Road Map, the Quartet and Tony Blair should be consigned to the dustbin of history. The conflict needs a new peace process, as Hammond has emphasized. Israel needs to accept that the starting point for negotiations should be based on international law: that the Palestinians have a right to self-determination within Palestine; that the incorporation of conquered territory into Israel in 1948-49 was illegitimate; that the occupation of Palestinian territory since 1967 is unjustified; and that the settlement program is illegal. Pressure from the US will be needed to achieve this. Only the US people can force a change in US policy. To do so, their understanding of the conflict needs to be improved. Conclusion 13. The Oslo process has been a futile waste of time. It should be abandoned in favor of a new process, and this needs the support of the US government. Only the US people can bring this about. 3. To incorporate the Bedouin population into Palestine, if they so wish. This is not a new idea. The Negev was allocated to the Jewish state in the Partition Plan as an area capable of absorbing large numbers of Jewish immigrants, having at the time only a small population of mostly semi-nomadic Bedouin. The UN Mediator was the first to suggest, in 1948, that some of the Negev be transferred to the proposed Arab state, as compensation for the loss of western Galilee. The Arabs, at Lausanne in 1949, said that they would need the Negev to accommodate the returning refugees, since Israel was not willing to accept them. President Truman’s diplomatic note to Ben-Gurion said that Israel should provide territorial compensation for areas it had acquired outside the Partition Plan borders (see section 10). The de facto enlargement of Israel in 1948-49 meant that the original reason for allocating the Negev to the Jewish state was no longer so important. Population density is still low, with only 10% of Israel’s population living in the Negev although it covers over 50% of the area of the state. Conclusion 14. Palestine deserves and needs territory in the Negev as compensation for the land stolen by Israel in the 1948-49 war. We have seen that Ben-Gurion’s government never intended to stick to the Partition Plan borders. Its declaration of sovereign borders on May 14, 1948 was a deception practiced upon President Truman, designed to elicit his recognition of Israel. A few days later Israel had already seized Jaffa and north-western Galilee, outside those borders. President Truman condemned Israel’s attempts at Lausanne to retain territory outside its borders. Since those days, Israel and its Zionist supporters have practiced another deception: that the border declaration never happened. As far as this author can determine, no Israel Government or Zionist document about the recognition of Israel by President Truman has ever mentioned the declaration of borders in Epstein’s letter requesting recognition. A good example of the intent to deceive is the article by Kleiman about Israel’s Declaration, discussed above in section 4. He tells us that the National Administration voted to exclude mention of borders in Israel’s Declaration, and that Ben-Gurion removed all references to the Partition Plan. He also says that last-minute changes were made to the Declaration on the morning of May 14, but does not tell the reader what they were, leaving the false impression that Israel was declared as a state without specified borders. Epstein’s telegram to Shertok not only gives the text of the request for recognition, and of Truman’s reply, but also says that Epstein was specifically asked about the borders. The document was apparently buried in the Israel State Archives until 2012, when it was linked to by the Archivist in a story about a visit to Washington by President Peres of Israel. That link, and this author’s own writings, seem to be the only links to this important document on the entire internet. Furthermore, the document is a facsimile that is not searchable. The only plain text version of this document on the internet seems to be the one that this author has created during preparation of this essay. Many more Arab inhabitants have been added to the population of Israel as a result of the inclusion, within our territory, of further areas in pursuance of the frontier changes made by the armistice agreements. He is claiming that the armistice agreements have changed the frontiers of Israel, despite the fact that the Agreements themselves explicitly deny this. Conclusion 15. Israel and Zionist apologists have attempted with considerable success to hide the fact that Israel declared its sovereign borders on May 14, 1948, and to give the false impression that the Armistice Line of 1949 is its recognized territorial border. I once believed that “Israel has never declared its borders”. I often repeated it in internet discussions. It was one of those things that “everyone knows”. I was corrected by the blogger talknic. He has been researching and writing about this topic since before the days of the internet. His website provides answers to every piece of Zionist propaganda. I, and every one interested in the Israel-Palestine conflict, owe him an immense debt of gratitude. There are some puzzling pieces missing from my account. If any readers can provide more information, through the comments section, they would be doing myself and others a great service. I will reply to all comments. Section 1 mentions a resolution of the 1921 World Zionist Congress approving the idea of Palestine becoming the “common home” of Jews and Arabs, and speaks of the “national development” of “each of its peoples”. The only text of this document I can find on the internet is Churchill’s quotation, though it is listed in the collection of documents by PASSIA. Can any reader confirm the full text, and/or give some background as to how this Congress came to embrace the bi-national state concept? At the meeting of Zionist leaders on May 14, 1948, did Ben-Gurion really turn up with a new draft of the Declaration which did not mention the Partition Plan? If so, who proposed to put it back, what arguments were used, and why were they accepted? Kleiman’s article says that copies of the various drafts are available in Independence Hall in Tel Aviv. I hope an Israeli reader might be able to visit, look at the exhibits, and let us know. There is nothing in Epstein’s telegram to Shertok that suggests Epstein knew about the debates over the borders which were going on in Tel Aviv, and the time scales make it unlikely. Is it known how he came to specify the borders in his letter: was it as a direct result of his conversations with Clark Clifford and Loy Henderson, or was it always his intention? I have not yet been able to read the recent book by J.D. Judis about the founding of Israel, Genesis, which discusses Truman and his attitude to Zionism. Does the book cast any light on the events in Washington on May 14, 1948? Why is the International Precept sovereignty not addressed in the entire premise? 2.1 State of Israel wont reference the Peace Treaty because it does not exist. 2 Question: From whence does State of Israel acquire its sovereignty if not from November 29th 1947 UNGA 181? 3 Why would UN General Assembly of Article 84 Administrator for UNGA 181 State of Palestine pass an Article 84 UNGA 3236 empowering PLO with limited sovereign powers “towards the [UNSC 242] obligations of the Security Council if General Assembly was not the UN Article 80 Trust Administrator Organ for UNGA 181 Trusteeship State of Palestine? 4 Why would the the UN General Assembly under Article 10 “scope & powers” pass UNGA 3237 PLO Mission at UN & A/RES/67/19 State of Palestine Observer State UNGA 181 was not the International Law context for Israel_Palestine? Absurd premise that any Israeli-Palestinian negotiations could have of object to contravene Laws of Nations & Humanity: That would be “lawful means of negotiations to an unlawful end” of War Criminal Enterprise as defined in principle of Nuremberg Principles. 2 Whereof, Vienna Convention on Laws of Treaties, Article 53 “jus cogens” vis-à-vis I_973 (IV) Geneva Convention would invalidate any State of Israel Netanyahu vis-à-vis Palestinian Authority Abbas Agreement from the get go. III. UN Organization Authority : Self-evident that the UN Organization has the Laws of Nations UN Charter lawful authority to Partition the Mandate of Palestine. 1. UN Charter, Chapter IV. 1.1. Article 10 “scope & powers” : Partition of the Mandate of Palestine. 2.3. Article 81 Administrator: UN Organization itself. IV. UN Resolute Action vis-à-vis its UNGA 181 Trust for the People of the UNGA 181 State of Palestine : Self-evident that the State of Israel does not possess any territorial claims to the UNGA 181 State of Palestine. 4. UNGA 273: UNGA 181, A., PH 8 “(b) Transitional period” superseded with UNGA 273. 1. Whereof, UNGA 181 A., PH 8., “(c) The Security Council determine as a threat to the peace, breach of the peace or act of aggression, in accordance Article 39 of the Charter, any attempt to alter by force the settlement envisaged by this resolution. Roque, thank you so much for taking the time and trouble to respond to my article. I should explain that this is a very preliminary draft of a book I plan to write, and my thinking has advanced considerably recently. I have published an article about the Partition Plan on Mondoweiss.net which clarify my ideas on that topic and the source of Israel’s sovereignty.Unfortunately that site is not working correctly at the moment. When it is, I will post a link here for you. Roque, Mondoweiss.net is working now. Locate the search box on the home page (just a small grey circle with a magnifying glass) and search for “understanding the partition plan”. >>The Arabs objected to the inward migration of large numbers of foreign Jews into Palestine, and there was a popular revolt against the British administration from 1937-39, in which Jewish settlers were also attacked. The protests were violently suppressed by British forces working together with Jewish members of the Palestine Police and Jewish militias. I see no evidence of any form of resistance by Palestinians in 1937. What I’m seeing is the most violent attacks on the Palestinians in 1936. Hello Nick, good to hear from you. Thank you for that information and link. Most informative, but i have no time to digest it all. I have a question for you. I think it must be you who told me about a website where some rabbi has compiled a lot of remarks by early zionist leaders who were talking about expelling Arabs. But I cannot find the link. Can you give it to me again? by the way, if you read anything by David Gerald Fincham on Mondoweiss.net, that is me. A nice man who lives in Hebron in a settlement called Kiryat Arba has written an essay/book/web-site on the subject of transfer. I think it deserves rather more publicity than it has yet received – saves an awful lot of faffing around. >>… during the 1970s when I was Director of Jewish Studies at a Jewish High School in the North of England. This was the period when Arab students at the various British Universities began to utilise the campuses to propagate anti-Israel propaganda. The Jewish students at the Universities were the first line of Israel’s defense, but at the time they had not been briefed on how to answer the Arab students. I therefore brought out a booklet entitled “How to Answer Anti-Israel Propaganda” and this booklet was used with some success on the campuses. >>Whilst researching this booklet, I came across an anti-Zionist book which devoted a couple of pages to show that there had been various proposals in the past to transfer Arabs from Palestine. I must admit, that at the time, this came as quite a surprise to me, and I decided that when I had some time available I would look more deeply into the question. I assumed that there were just a few stray statements on this subject and that after I had researched them, I would publish an article on the topic. Thanks Nick, that’s the one.